Conway radio station Y107.1 My Country chose Physical Education teacher Karen Vandivere to be recognized on its "Working Women's Wednesday" segment. 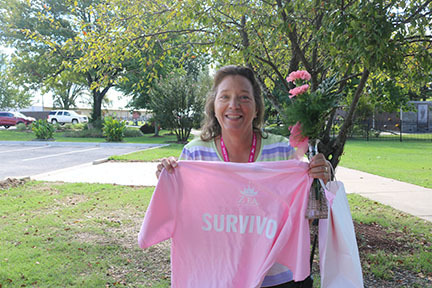 A representative from the station gave her flowers, a shirt and a goodie bag. It was also noted Ms Vandivere is a breast cancer survivor. She was nominated for recognition by St. Joseph Alumna Abigail Covington.